The following interview is done with Kathi. Tell us first what the name RUDRA means. And why was it chosen as the name of your band? Rudra is the name of ancient Vedic Storm God. Also known to be an epithet of Lord Shiva, the God of Destruction in the Hindu Pantheon. Being a Death Metal band and playing a violent form of music we found the concept of destruction very appealing to that genre. Moreover, being of Indian descent and influenced by the culture, we wanted to adopt a name that will best represent our roots. We understand that Rudra broke up in the past, later rejoined and renamed, slightly, from Rudhra to Rudra. Explain to us why the break-up occurred and how you got back together? Why also, was the name changed? During the last days of Rudhra, we were really unhappy with what we were doing musically. There were two camps in the band. One wanted to play conventional Death Metal filled with technical riffs while the other wanted to combine both Death Metal and Indian Music. This caused the break-up, being not able to accept each other's aspirations. During this time all the members of Rudhra except myself got involved in other Death Metal bands. Several months later, I called up Shiva and spoke to him about a new musical direction that I intend to take as a project band. And Shiva who happened to be in my camp during Rudhra naturally agreed to be part of this new direction. We started working on the new songs and recruited Alvin as the first guitarist. During the course of our practices, we decided to call the band Rudra. Soon after Bala returned to the Rudra-fold just in time for the recording. A musician friend of ours, Burhan from the band Manifest, was called to help out in the second guitar works in 4 songs. The change of name for the band was mainly due to two reasons. The first was because of the pronunciation of the name Rudra, a Sanskrit word. When looking for a band name when we first did a song for a compilation album back in 1992, we came with this name just 2 hours before the recording. A few months later, we discovered that the name was not the exact transliteration of the Sanskrit word. But it was too late, as we were already known as Rudhra. Now that we were given a opportunity to start afresh. We took advantage of it and renamed the band, as Rudra (pronounced 'roo-draa'. 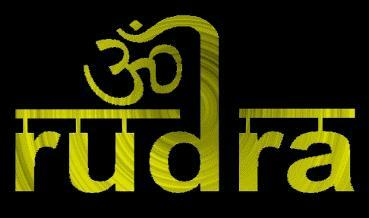 The second reason is to create a distinction between the old conventional Death Metal Band Rudhra and the new Rudra. Tell us the current line-up and biography of the band. The current line-up is made up of myself doing the bass, vocal duties, Shiva –Drums, Bala & Alvin – Guitars. Alvin is presently serving a mandatory military service that all male citizens have to undergo in this country. Shiva is an undergraduate in a local university. Bala is working as an engineer while I'm working as a Technical Officer. Your music is very unique to the black/death metal scene. Incorporating Sanskrit verses and traditional indian classical pieces with a death/black metal sound, giving it a very uncommon twist. Tell us your influences, musically and lyrically, and how you came about this style. This style is a representation of our culture (particularly the Hindu Culture) and our musical influence. Presently all the music of Rudra is written by Shiva and myself. Being Indians, it was natural for us to display our roots in the material we produce. And bringing the Western and eastern worlds together was very exciting to us. We (the whole band) are ardent fans of Death/Black Metal and Indian Music. Our musical influences include many bands such as Slayer, Death, early Sepultura , Obituary, Napalm Death, Emperor, Cradle of Filth, Kreator, Bathory, Dimmu Borgir, and many other bands. Although we listen to these bands, we try not to sound like any of them. On the eastern side, I listen to Ravi Shankar and many other obscure Indian artistes. All the lyrics that I write are inspired by an Indian School of Thought called Vedanta. Particularly, the Advaita Vedanta, a non-dual philosophy. You are currently unsigned. Have any labels shown interest? So far we are yet to send our promos to any of the labels. We intend to submit our promos once our CD formats are ready. A local production company will publish our album in this region. Some of your lyrics in your new effort, RUDRA, deal with Christianity in a rather negative light. What are your views on Christianity? And why? This is where we might differ from other Death/Black Metal bands. First of all, I must confess that I have no animosity with that religion. But what pisses me off is the way they preach. To be truthful, I consider Christ to be a Divine person also accept his teachings. I consider Christianity to be a great religion as long as I don't bring the Christians ( I refer to the majority of the Christians I have come in contact with) into the picture. I find them to be worst Bigots and dogmatists. The teachings in the Bible are great and I find no difference between the teachings of my culture and the Bible's. Just that everyone wants their religion to be exclusive. I do study the Bible at times and get some inspiration from it. Tell us about the lyrics of the songs, Black, Warreligion, and Sin. Black is a song inspired by my meetings with several Christian Missionaries. Wareligion is a song about Holy Wars. People who wage wars in the name of religion. This song points out that all negative actions are the product of our ego. Sin is a song about the notion that we are all born sinners. I will never be able to accept the fact that I'm born sinner. And I can find nowhere in the Bible which states it Boldly or Extensively. I hate it when someone labels another as such. the divinity of the soul. Who does the Sanskrit chants accompanying your music? The Sanskrit chants are performed by a close friend of mine by the name of Prakash who has some experience chanting the verses. You use a quote from Aleister Crowley... 'Do what thou wilt shall be the whole of the law.' What are your thoughts on him and have you read any of his works? I don't completely agree with Crowley's thoughts on the Occult and spirituality. I have read two or three woks of his. My attitude in learning is this: Take the best and leave the rest. I particularly like this line of his. Although he has interpreted it in several ways to suit his needs. I like his original interpretation of this line. Tell us about the black/death metal scene in Singapore. The scene here is not very active but there is always a fixed no. of faithful followers. There are only about 10 Death/Black bands or so existing in this island. And most of them have no recorded material. Your release is dedicated to the late 'Saint of the Gutters.' Could you explain who this is and why the dedication? The Saint we are referring to is Mother Theresa. We have dedicated the album to her as a tribute to a selfless soul who dedicated her whole life to the emancipation of the poor and unfortunate. This is someone whose equal is so rare to find in this age of decadence. It seems that all of the bands we interview share a mutual opinion of the world today. It is a dark, rather hopeless one that appears to span every nationality and culture. Tell us your thoughts on the world, its past, and its future. Do you see the end that so many others envision? Do you see any hope? Good and evil are perspectives of the mind. What might be considered good at a certain place and time may be considered evil in different place and time. Therefore, we can say that there will never come a time when the world will be full of goodness. Like what I've said earlier, good and evil are only perspectives of the mind. Religions are there to save people but in most cases they take a fair share of lives. In the past we have seen the diabolic work of religions; the burning times, the crusades, the English wars in the 12th century (they were countries belonging to the same creed), the Jihads. Instead of religions being the saviour it became the cause of all these inhumanities. By saying the world is dark, it is not going to make the world any brighter. If anyone is so concerned about the state of the world, then he/she should take the weight on his or her shoulders and become the light that will illuminate this world. The path to such perfection is a personal one. And the quest is also a personal one. There can be many followers who would cry at the state of the world but only one in a billion will stand up steer the world. I don't see an end. Even if there is going to be an end, I would be least bothered by it. I have to work on my own freedom and set my soul free. Like what I said earlier. It is a personal quest and I won't impose it on others. Most of the problems in this world will be solved if only we changed our mindset and learn to accept things as they are. Hope is always there for everyone. It is knocking on everone's door every second and we just don't seem to be interested in opening the door. How is black/death metal seen by the public in Singapore? The public of Singapore are very tame. They see Black/Death Metal as a negative form of music. Organising metal gigs is a problem here as they consider it an indirect promotion of violence. Do you play live? If so, how are the turn-outs? We used to play live quite a bit as Rudhra. Since Rudra, we are cutting down on our gigs and concentrating on promotion and clinching label contracts. We have been invited to appear in the coming Singapore Metalfest to be held this August. The turn-out is expected to at least 1500. Tell us the future plans for Rudra. Rudra will be releasing the self-titled album in CD formats soon with 2 bonus tracks. After which, we will be promoting our material to all the Labels, hopefully to get a deal. We will be taking things one step at at a time. Alas, give us your final thoughts... Before I say farewell, I would like to thank you for giving us an opportunity to be interviewed. We are ever so grateful to you folks. Thanks a million. All the best to you.